While it’s somewhat gratifying to see the technology get “mainstream” attention in a major business magazine outside of our bubble of industry publications, we want to look deeper into the trends going on out there and share where they are relevant to you and how they can best be applied. 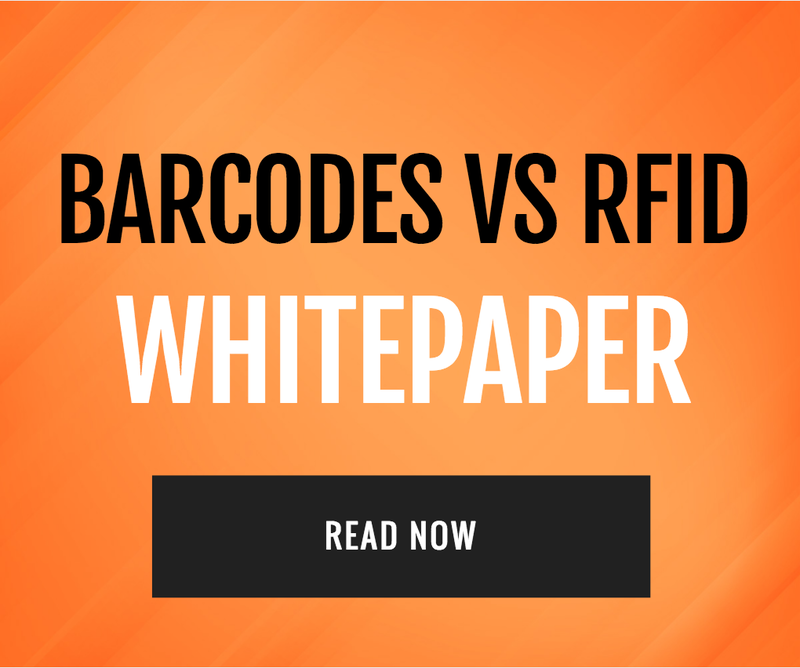 While the growing adoption of RFID in the retail industry might be what we thought we would see eventually, the way it has been adopted might not have been what we expected. It Started As a Tool Against Shoplifting. 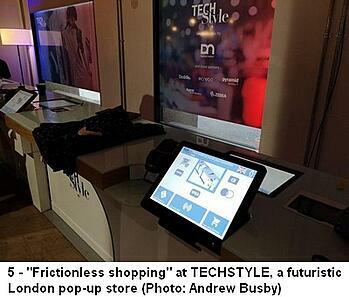 The issue with the original concept for RFID in retail was that it wasn’t about making things EASIER for the consumer, it was just another technology being intrusive on the buying experience. That’s because it was originally conceived as a security measure to reduce shrinkage. The idea was that a scanner at the exit would detect anything leaving the premises that weren’t paid for. But like similar magnetic devices in use today, it added a step in both the stocking and the buying process. And then there was the cost. According to the Forbes article, when Walmart became the first high-profile retailer to try this strategy almost twenty years ago, tags cost about $1.50 each, which by default would seem this was a solution better-suited solution for high-end boutiques or high price point items only. And then it disappeared as a viable an option for over a decade. For everyone NOT in the retail business, it might not be surprising to find out that inventory has become the darling of the industry when it comes to RFID adoption. Recent 2018 studies by both Zebra and Accenture show retailers reporting stock visibility at only about 65%. With service level demands on retailers increasing in complexity – customers want it faster, when they want and where they want it – RFID has the ability to raise that visibility to over 90%. With this in mind, the Accenture report “Transforming Modern Retail” indicates 92% of retailers IN THE PROCESS of adopting RFID with a view to full adoption. That’s an incredibly high number, but when you lay out the logic for RFID in retail INVENTORY, it makes perfect sense. Because a comprehensive RFID strategy to your inventory unlocks a long list of benefits that you may not have thought of in previous trials with the technology. While the photo at the very top of this article (from “Minority Report”, 2002) might seem within reach, unfortunately, it would only be possible (and far less intrusive than the movie’s eye technology) by embedding RFID chips into consumers. 1. Inventory - as already noted above, raising your inventory visibility from 65% to 90% or more means fewer lost sales, faster fulfillment and better allocation across channels. 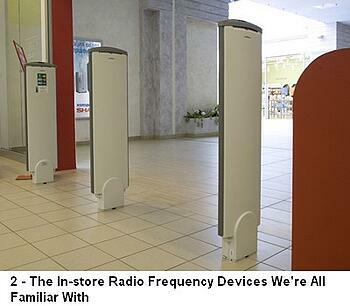 This aspect of RFID is a no-brainer for almost any retailer. And for most retailers, taking inventory is a major operation that takes a facility offline and thus can only happen a few times per year at most. With RFID, inventory can become almost continual. The tags mean a retailer can do stock checks nearly every day if they want to, and they will also have a view of every product at every stage of the supply chain. If we think through all the scenarios that might make our jobs easier like “Let’s pull all the units that came from the Toledo plant, we just found out that they are missing a part in the package and we need to add it in before we can sell them.” then the case for finding a way to implement RFID just gets more interesting. 2. Returns – Given that 30% of any omnichannel retailer’s returns come back to their brick and mortar stores, and that the processing for the rest of them at a distribution center is far more chaotic and time-consuming than the process for generating the original shipment, being able to scan in any box or bag that comes through the door means they can be separated before opening (if necessary) by any classification your business needs – processing location, product type, return eligibility, etc. Because the tag will be able to tell you who returned it, when it was ordered, how much was paid or any other information that can be linked to the tag from the original order. With half of the retailers surveyed already adding surcharges for returns and the half of the rest now considering it, speeding up and simplifying the return process could be one path to avoiding a policy considered not to be very customer-friendly. a. Customer Engagement – how to bridge the gap between the consumer preference for more information online and those who still have a preference for shopping in-store and seeing and touching the product? 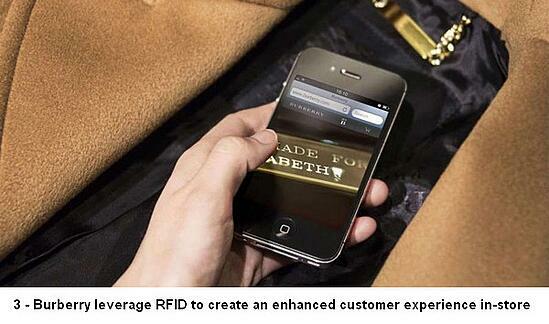 In 2012, Burberry started using RFID in their flagship stores to enhance the in-store shopping experience by providing customers information they can view on an app that picked up data from the items they were looking at. Details on the materials, manufacturing process, location, sizing, etc can all be provided this way to either the users own phone (where it can then also be stored or used to place an online order later) or to a tablet mounted on the product display. b. Customer Satisfaction – A 2017 article in Stores.org magazine reviewed a pilot Macy’s was doing at the time where they found that test stores performed significantly better than control stores in regards to display compliance, back-to-front, inventory visibility and single-unit fulfillment, all of which led to higher customer satisfaction. The bonus for Macy’s was also data showing higher sales at both full-price and after the first markdown, which is all margin for the retailer. 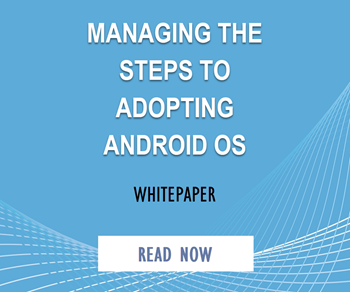 While it is a good place to start – especially if you are at or below the industry average of 65%, inventory visibility isn’t the only benefit you can design into your RFID solution. Think through the secondary applications like those we’ve shared above, and think beyond your current customer experience and internal workflows to imagine what else is possible with every product carrying around a tag with its own cache of data about the product and almost anything else related to it. At the end of the day, the scenarios you create that can be validated as having value for your customer will inevitably create a benefit for your business as well.